Halloween is coming up fast, which means it’s time to get your little one’s costume ready! 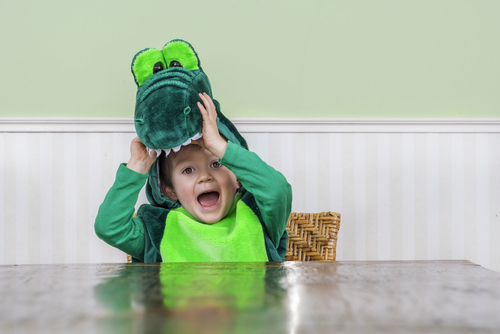 Whether your child is a newborn or school-aged, dressing up for Halloween is a fun tradition you can enjoy together. Although Halloween costumes are fun, they are also a lot of work. Sometimes half the battle is deciding what your little one will be for Halloween in the first place. To help you out, we’ve come up with three fantastic costumes to choose from. Below you’ll find DIY instructions for each costume idea so that you can have fun crafting your favorite one with your little one. The M&M This classic candy is the perfect easy costume for children young and old. It’s simple, but festive and exciting for kids. Who doesn’t want to be chocolate? Young children will especially enjoy picking out their favorite color M&M. How do you make it? Simply pick out pants and a shirt of the same color. The official M&M colors are: brown, yellow, red, orange, blue and green. Then, cut out an “m” from a white piece of paper. It should be about the size of your child’s chest. Tape it on and voila! If preferred, you could also make the “m” out of white felt and glue or stitch it on to the shirt. The Robot This costume is great for children about age 3 and up who can get involved with the design process and decorate with you. It’s an open-ended design project, so let your imagination run! How do you make it? You’ll need two boxes: one for the head and one that will fit over your child’s chest. First, cut holes in the larger box for your child’s head and arms to fit through. Then, cut out eye holes on the smaller box. You’ll also need to leave one end open for the head to fit through. Then, paint the boxes the color of your child’s choice. Finally, add buttons, screens and panels using aluminum foil and a black permanent marker. Add dials by gluing on bottle tops. If you want to get more elaborate, you can have your child make robot shoes using two empty painted Kleenex boxes. Add additional touches as you like. To finish off the costume, have your child make robot beeping noises as they trick-or-treat. Dinosaur All you need is a hoody and some felt to make a perfect stegosaurus costume! Great for children of all ages, this costume can be modified as you like to use your child’s favorite colors, include teeth, claws and spots, or whatever else you and your child would like to add. How do you make it? Take a sheet of felt and fold it in half- the long way (hot dog bun style). Draw large triangles (at least about 4 inches tall) so that the crease is the bottom of the triangle. Cut out your triangles through the 2 layers of felt, without cutting the crease open. Repeat until you have 10-12 triangles. When you open each triangle, it will look like a long diamond. Pin the opened triangles along the center of the hoodie and down the back. Sew down the middle of them. Then, fold the diamonds back into triangles and glue them shut with a hot glue gun. You can add teeth around the opening of the hood using small white felt triangles and a glue gun. Then practice your “roar” and the costume is ready! We wish you fun while costume crafting and a happy Halloween!